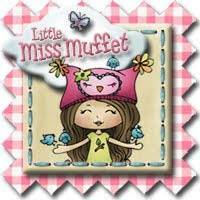 Little Miss Muffet Stamps has new images being released today and I am SO excited to showcase one of them today. As the mom of a deaf son I love that LMMS has images that show ASL signs and today's new image is a MALE image doing the ASL sign for "thank you" (hand at the mouth moving out and away from the face). How cool is that? The image is called Polka Dot Pals Ian and can be found HERE. I especially love the shark shirt because my boys, both deaf and hearing, love sharks, so this image gets a double like from my crew :) To find any of the images that use ASL signs just go to the LMMS webpage, type ASL in the search bar and boom! all the images will show for you, it's super easy! I did my usual and stuck with more earthy colors for this card, with browns and blues this time. I just love the background paper, it's from a paper stack I got on sale at JoAnn's! Make sure you head on over to the LMMS Challenge Blog to see what the rest of the team created and then play along with us in our Anything Goes Challenge!